So according to the wonderful and reliable source called Google, the average cost of an engagement ring today is about 5k. I think somewhere in the big scheme of things, many women have come to the conclusion that somehow the size of the diamond equals the amount of love or commitment to the relationship. The ring serves as “proof” that you’re actually engaged and plus you get a chance to show it off to your single friends and enjoy their jealous “you’re so lucky” looks. In addition to a ring, I know of people who have been proposed to with watches. Definitely a more practical option because it serves the purpose of telling time, however the romantic factor may be lacking. Honestly thinking about it, engagement rings are more for the romantic factor. How practical is it to drop the price of a decent used car on something that perches happily on your finger? However, the very impractical side of me really doesn’t care because like most people, I genuinely appreciate a nice gift, practical or not. I’m not going to lie, I see engagement rings that look like this and inwardly I cringe. And while I’m not going to say that I have fully escaped the grasp of materialism, I will say that this ring is a complete joke. Honestly, if I got proposed to with this ring I would give it right back to the giver. 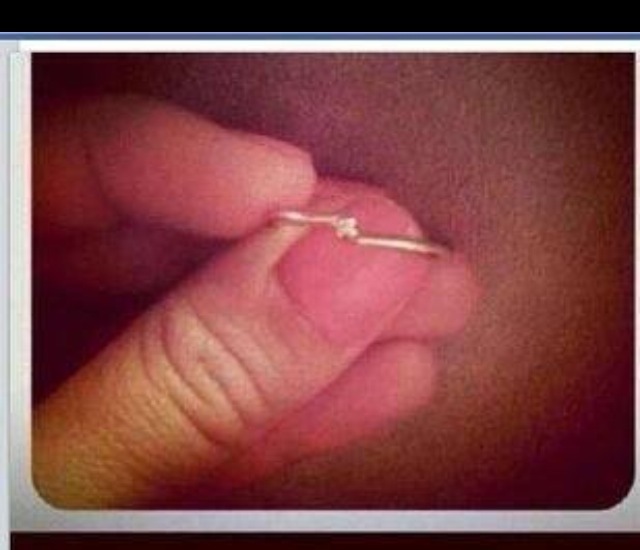 This ring defeats the purpose of a engagement ring. Nowadays, the current fad is for both people to contribute equally to the cost of the ring. While I’m not advocating picking something so extravagant that you spend years on the payments, I am saying that it should be a decent size. It’s an “all or nothing” concept. If you can’t afford it, don’t buy it and don’t try to fix it up with something that looks like the above picture. It’s an insult. The whole “thought that counts” thing applies to not buying anything or just saving up. There’s no middle ground.